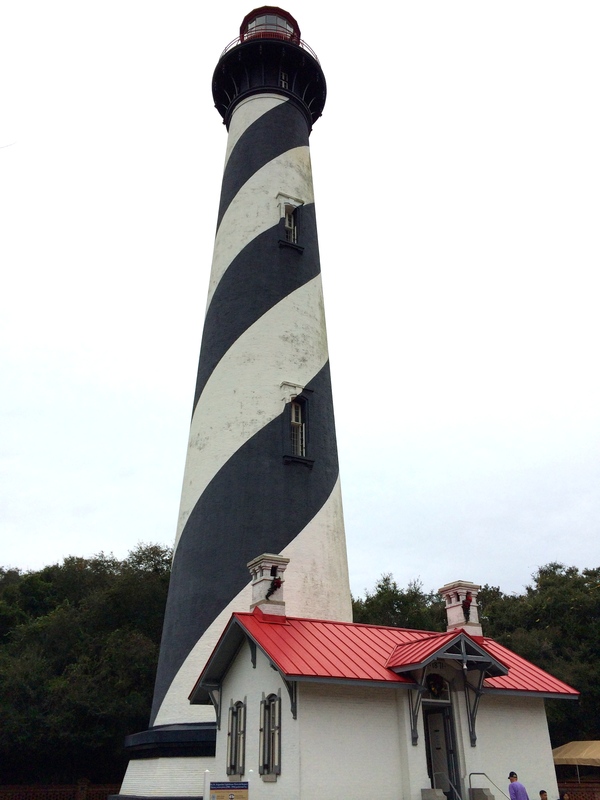 Coasting: Climbing’s not necessary to enjoy St. Augustine Light! | Oh, the Places We See . 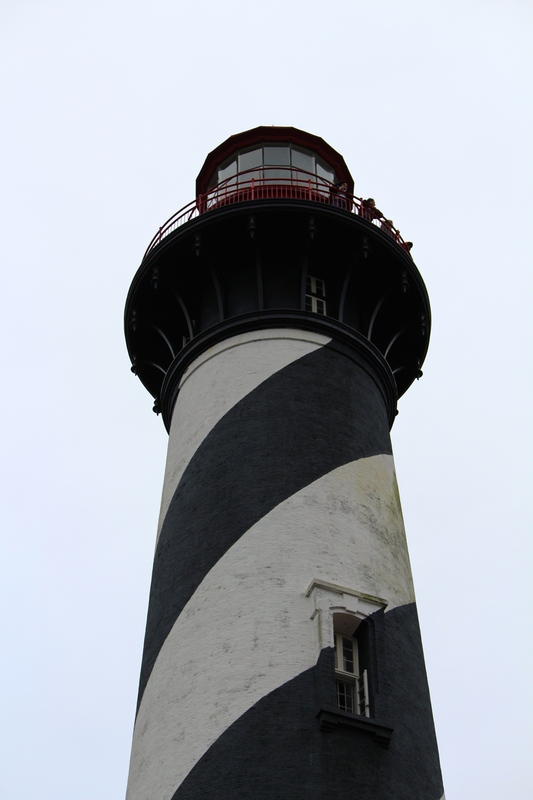 . .
Coasting: Climbing’s not necessary to enjoy St. Augustine Light! With our third entry in the Coasting series based upon our stay in St. Augustine, we have this maybe-because-we’re-old-folks revelation: You don’t have to climb to the top to enjoy the St. Augustine Lighthouse! Really? you might say in disbelief. You couldn’t even make it 219 steps for a glimpse of the nation’s oldest port and the beach and the city? Well, sometimes you just can’t do it all when you travel. Or you’re not able. Or just not inclined. But you can make the most of what you see. So what’d you do if you didn’t climb up? you might ask. And we’d answer: Try this! 1. Stand back and look up. public. 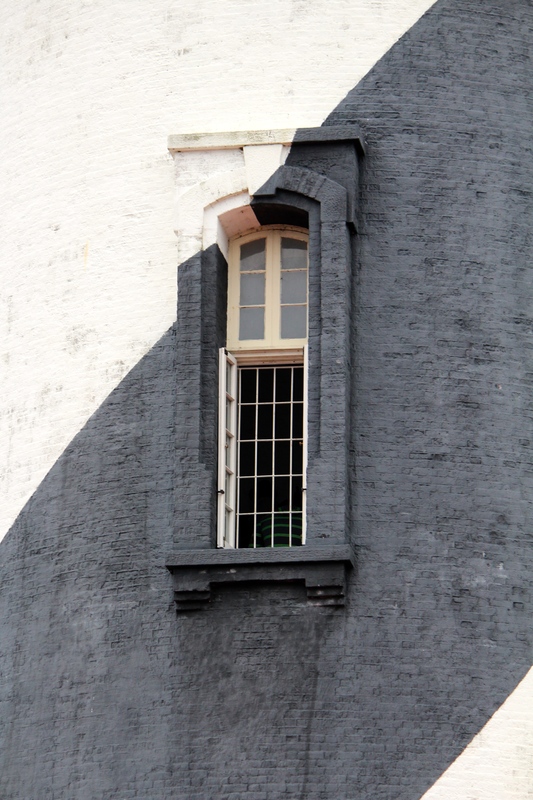 We loved the barber-shop swirls in black and white — its daymark, we learned. A daymark allows mariners to establish their location during daylight hours just by seeing the unique marking or paint on any given lighthouse. If you were to see these swirls, you’d know you were at St. Augustine. On the other hand, a nightmark is the timing of a lighthouse’s flashing signal that identifies this and only this one particular beacon for seagoing vessels. Before the automation in place today, the St. Augustine Lighthouse was known for this nightmark: one bright flash every three minutes, a pattern that existed for 62 years. 2. Go inside. Read. Take pictures. You can also peer into the stairwell for patterns and photo-ops or just chat with the ones who made it to the top and back. You can even ask a ranger about the paranormal tour — Dark of the Moon — that will take you to the top for a moonlight view of St. Augustine. 3. Visit the Harns where they used to live. 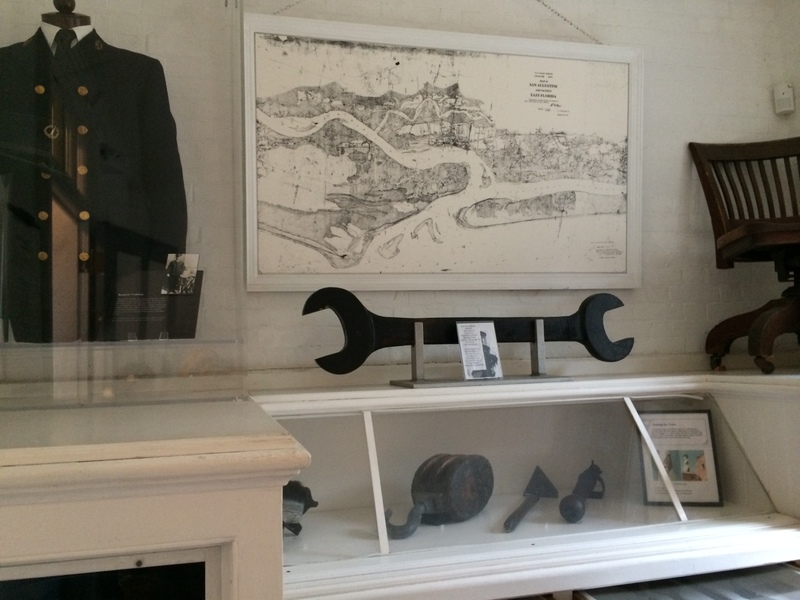 In the setting of an actual lightkeeper’s home in the 1880s, learn about the family of William Harn, the first long-term St. Augustine Lighthouse keeper (1875-1889). Sit in the Victorian parlor, read about the six daughters in the Harn family, or try your hand at some of the interactive games. At Home with the Harns helps you imagine what it would be like to live onsite and maintain a lighthouse day in and day out. 4. Watch artisans at work. We’re not sure how many artisans ply their trade in an area to the right of the lighthouse or even which days of the week. 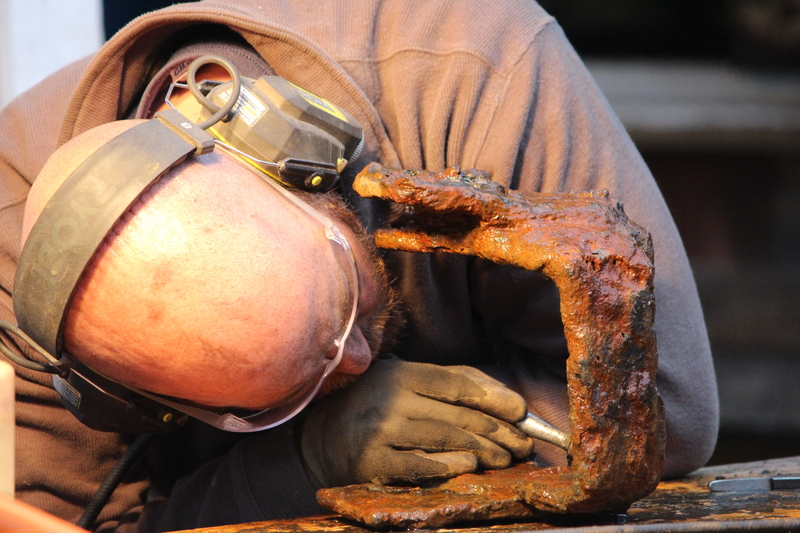 But we could see one artisan scrutinizing an old piece for cleaning and repair. Artisan scrapes and cleans an old piece at the site of the St. Augustine Lighthouse. Fascinating indeed was one finely crafted boat sitting under cover where we could examine the dovetailed joints and braces holding pieces together. 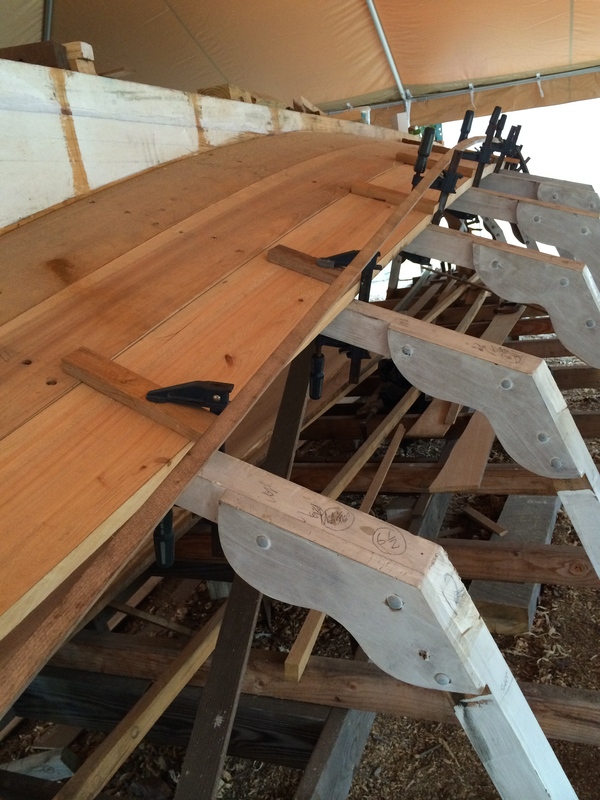 Digging through the St. Augustine Lighthouse website revealed this information: Three mornings per week (Tuesdays through Thursdays), volunteer craftsmen build traditional wooden boats. 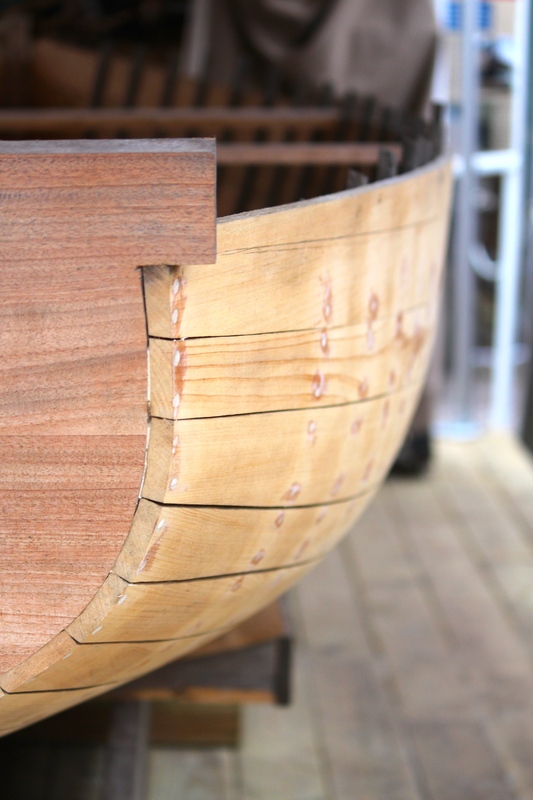 And according to the site: Using an old steamer box to soften the wood, each board is carefully molded into the keel, ribs and planking of a functioning vessel. 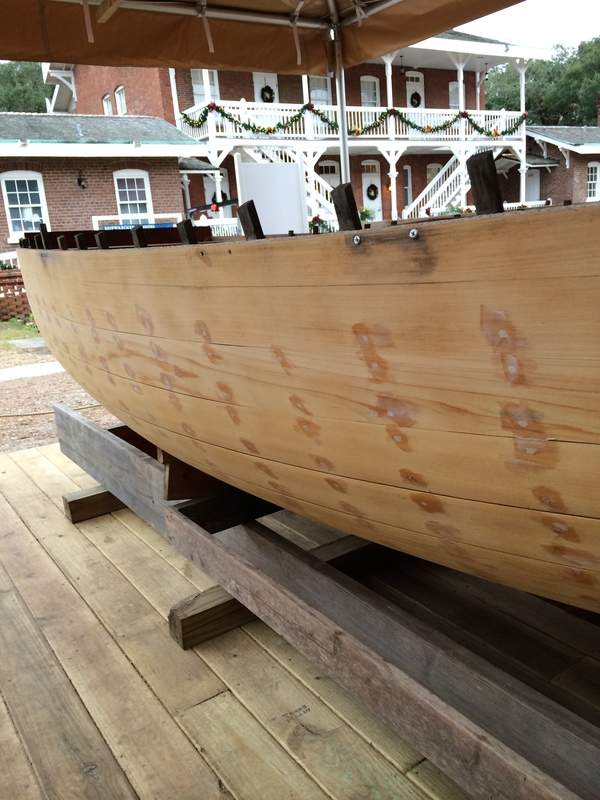 Once a year, a completed boat is auctioned off to raise money for the maritime preservation and educational programs at the St. Augustine Lighthouse & Museum. 5. And then just envy those who climb. OK. So we really wanted to climb. Just couldn’t make it on the day of our trip. We looked up. Then waved. Then said, We oughta come back. That view is bound to be worth the stairs!!! Whether you ascend the light or remain grounded, the St. Augustine Lighthouse won’t disappoint. So here’s what we say: Travel at your own place. But make the most of any adventure, no matter when you go. 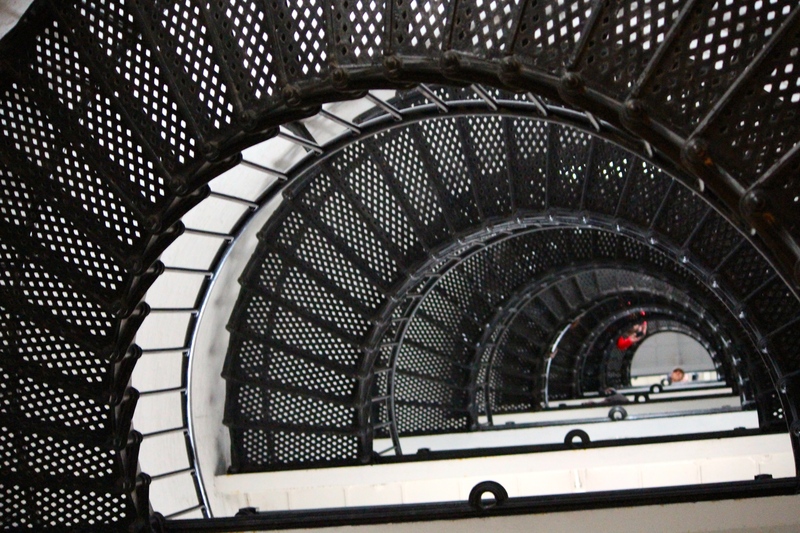 Have you been to the top of the St. Augustine Lighthouse? If so, tell us what we missed. We’d love to know what you saw! This entry was posted in Coasting, Florida, Travel and tagged Dark of the Moon, daymark, nightmark, St. Augustine Lighthouse, William Harn. Bookmark the permalink. 21 Responses to Coasting: Climbing’s not necessary to enjoy St. Augustine Light! I am a volunteer lighthouse keeper. There will come a day when I will no longer be able to climb the tower. They are still a beautiful reminder of our nations maritime heritage. Thanks for posting. Thanks for reading and commenting. I don’t know how you volunteer day in and day out. But thanks for all you do. We may have climbed up if we had arrived earlier in the day. But even so, climbing is not as easy as it once was. Best wishes to you for continuing the work you do until it is not enjoyable any more. We need people like you! Rusha, we lived at St. Augustine Beach (twice) and loved it. We had a house and then a condo a couple of blocks from the beach and it was wonderful. As you probably discovered, SA is a special place. Also, I love the interesting little neighborhood around the lighthouse. This little pocket of unique, eclectic homes is laid-back and pretty neat. Thanks for a walk down memory lane. What great information! I’m constantly thinking, “What took you so long to get to SA?” It really is a wonderful city — such diverse activities and a playful attitude even with all the historical forts, homes, etc. Wish we had driven around the homes near the lighthouse — we love to take side streets and look at houses — just one of our fave things to do when we travel through a town or city. You’re making me think we need to go back!!! Well, thanks, Linda! Hope you enjoy traveling no matter if you go up, down, or all around. It’s all good! Happy Valentine’s weekend! You’re so right. It’s all good. We arrived late in the day and just decided to see all except the view from the top. But most people want to “check off” that they have been to the top of the lighthouses they visit. A great goal! Curt, it was new information to me also. So that’s why we put it in the post. It does make sense and explains why each lighthouse is different. Or I guess each lighthouse is different. Need to look into that! Thanks so much, Cindy. Travel teaches us many things — and reading about them is only part of the experience. Seeing the places brings things to life! Love that stairwell shot. I’m sure the view was better from the bottom. Not sure the view was better from the bottom, but the view of the stairwell sure was!!! I love stairwells — graphic, swirling, interesting. Thanks for reading! Love you town tours! Thank you for sharing! You are quite welcome, Amy! Thanks for touring along with us! We missed that on our recent trip to St. Augustine, but now have a reason to return. Thanks for the great write up and photos. Neil, the lighthouse is pretty cool. So was the one in Tybee. I guess we just like to read the history of them and take a look at what’s similar, what’s different. Glad you enjoyed the post. always love seeing more of my favorite town – and your posts really show folks how wonderful st augustine is – and well, that first photo reminds me of when we there at the lighthouse on a day trip my sons were too little to go up (2001) and they were so sad – but then we went to the alligator farm (nearby) afterwards and it cheered them up. The artisan at work was a highlight for us as well. I would like to see the boat builders in action, too. What an interesting place! So much going on. Thanks for the comment!